Scanning transmission electron micrograph (right) and Ti3+ fraction [Ti3+/(Ti3++Ti4+)] extracted from electron energy loss spectra (left) for a SrTiO3/NdTiO3/SrTiO3 heterojunction. Electron transfer from NdTiO3 to SrTiO3 results in Ti4+ in the former and Ti3+ in the latter. The electrons transferred to the SrTiO3 are itinerant and constitute the highest density quasi-2D electron gas (3 × 1015 e-/cm2) ever achieved in a semiconductor superlattice. Revolutionary new electronic devices, such as those required for next-generation computers, require new and novel material systems. Scientists at the University of Minnesota and Pacific Northwest National Laboratory showed that combining two oxide materials in one particular orientation gives rise to a densely packed sheet of highly mobile electrons. The sheet is created when bound electrons jump across the junction of a neodymium-based oxide, NdTiO3, to a material based on strontium, SrTiO3, and become free. The density of these electrons -- the highest ever observed at the junction of two materials -- paves the way for a new class of electronic devices. Why It Matters: New kinds of electronic devices that exhibit novel functionalities are constantly being sought after to expand our technology base. One such device, which cannot be fabricated with existing electronic materials, is a high-frequency plasmonic field effect transistor. This device can turn a larger electronic signal on and off very fast, something not achievable with traditional semiconductor materials, such as silicon. The interface between NdTiO3 and SrTiO3 constitutes such a pathway, even though neither oxide conducts electricity as a pure material. 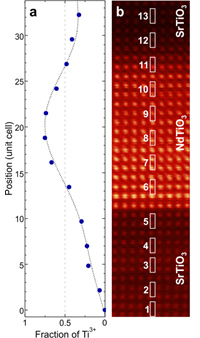 Methods: By depositing alternating, ultra-thin layers of NdTiO3 and SrTiO3 on a crystalline surface, and investigating their properties experimentally and theoretically, the researchers demonstrated that a very high density of mobile electrons can be generated and confined within the SrTiO3 layers. The mobile electrons jump from the NdTiO3 layers, where they cannot easily move, into the SrTiO3 layers, where they are free to move. Why do the electrons jump? A certain number must jump from NdTiO3 into SrTiO3 to stabilize the combined material system. The charges that stabilize the neodymium (Nd) and titanium (Ti) ions in NdTiO3 cannot be reached without electron rearrangement, and part of this rearrangement involves some electrons jumping across the junction into the adjacent SrTiO3 layers. However, when the NdTiO3 layer reaches a certain thickness, it becomes energetically favorable for additional loosely bound electrons in the NdTiO3 layer to spill over into the adjacent SrTiO3 layer, like water running over a waterfall. Once this happens, the SrTiO3 layers become conducting channels with a high density of mobile electrons. What's Next? This work is part of ongoing research into the electronic, magnetic, and optical properties of doped metals at Pacific Northwest National Laboratory. Sponsors: Work at the University of Minnesota was supported primarily by the National Science Foundation through the Materials Research Science and Engineering Center under awards DMR-0819885 and DMR-1420013. The band offset work at Pacific Northwest National Laboratory was supported by the Department of Energy, Office of Science, Office of Basic Energy Sciences, Division of Materials Sciences and Engineering. The computational modeling at Pacific Northwest National Laboratory was supported by the Laboratory Directed Research and Development program. Reference: P Xu, TC Droubay, JS Jeong, KA Mkhoyan, PV Sushko, SA Chambers, and B Jalan. 2015. "Quasi Two-Dimensional Ultra-High Carrier Density in a Complex Oxide Broken-Gap Heterojunction." Advanced Materials Interfaces. DOI: 10.1002/admi.201500432, published online on 24 November 2015.